Since opening in January we have received our fair share of visitors from outside Hong Kong. For these folks a stop at a used bookshop is just what the doctor ordered when traveling abroad, and they usually make it a point to hit one or two used bookshops along with the more traditional travel destinations and sights. This means we have met folks from Germany, Canada, Philippines, Australia, Britain, the U.S., and other far flung places (at least in relation to Hong Kong’s geographic location), and some have even become good friends of the book shop and its staff. Apparently our friends from abroad are not the only ones who think it is cool to visit used bookshops on holiday! Flight Network, one of the largest global travel agencies, thinks so too, and they made Bleak House Books an obligatory stop for folks visiting Hong Kong, in a recent online feature of theirs, entitled ‘72 Hours in the Exciting City of Hong Kong‘! 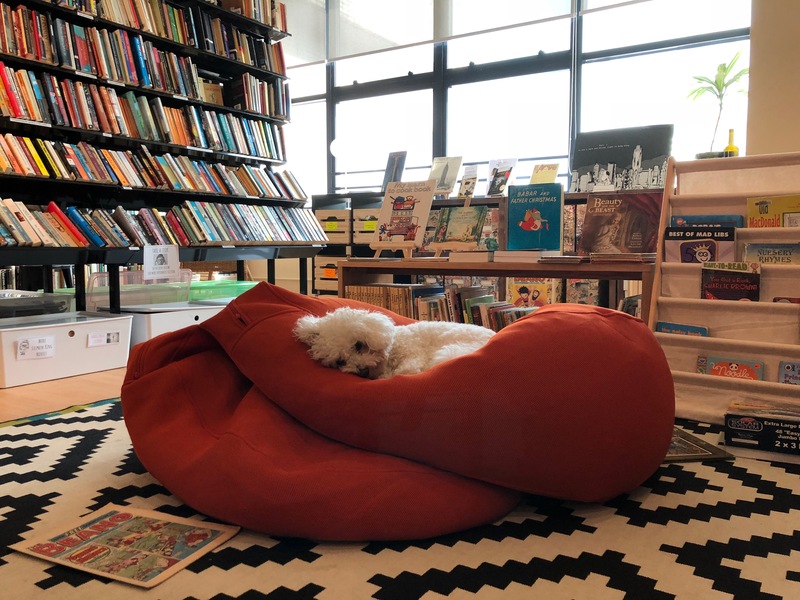 They even featured a photo of our part-time shop dog, Ella, who, as you can probably tell, was having one of her typical ‘long’ days at the shop. We are grateful for having been selected by Flight Network as a destination for folks visiting Hong Kong who want to take a load off and get lost in our wonderful collection of new and vintage books and comics! Who knows you might get lucky and end up sharing a bean bag chair with Ella while reading your favorite Dickens’ novel. Bleak House, perhaps? This entry was posted in Hong Kong and tagged Ella part time shop dog, Flight Network, Hong Kong, Travel. Bookmark the permalink.